The Arizona Daily Sun reports on the conflict between the full timers and the badge carrying rangers in the National Forest Service. Darrell and Rose found a camper, a van to pull it, and some solar panels for power. Now married, the Eddlemans live out of their recreational vehicle in forests around the Southwest with their dog, Freeway, and have seen a lot of the country. They now hike and visit with other campers. “I like this lifestyle a lot,” Rose said. Just one problem, in their view: The Kaibab National Forest doesn’t want them around and is recently stating as much. Actually, living in the forest is illegal, say Forest Service officials, pointing to federal law. One of the surprises was that the ranger didn’t cite staying past the 14 day limit by a day or two, he saw the Quartzite BLM LTVA sticker and decided on a residency use ticket. “Federal law prohibits building or “occupying or using a residence” on national forest land.” The ranger decided their MoHo was a residence. The implication is that any RV could be similarly categorized at any time on NFS lands. This treatment is unfair and a form of discrimination, they say, particularly when other presumably wealthier campers with homes come and go from campers that sit for months and face no penalties. Another aspect of this is the MVUM or motor vehicle use maps that the NFS publishes. You need to consult those maps to make sure that you don’t take your vehicle to where it is not allowed (anymore). It also brings to mind the land management companies comments about volunteer hosts and ‘badge and gun’ rangers in their attitude towards problems with campers. This starts to get one thinking about Robin Hood and the Sherwood forest. The August 2011 Newsletter has been posted! Links to photo galleries and additional information mentioned in articles in this newsletter can also be found there, too. See the special note from Bruce Rhymes. This is a special rally, the SNU’s first ever joint rally with another WBCCI Unit – The San Fernando Valley Unit. This is a two part rally. The first half is Thursday August 25 to Sunday August 28 at Obsidian Dome. The second part is Sunday August 29 to Wednesday August 31 Mammoth Lakes. Join us for one or both parts, whatever suits your schedule. Reservations are required for Mammoth Lakes. Contact Mammoth Mountain RV Park and mention you are part of the San Fernando Valley Airstreams. We’ve got some neat things planned for this rally so plan on joining us. See http://sierranevadaairstreams.org/snu/2011/events/11ag-obsidian.html for maps and detailed information. Floods happen. 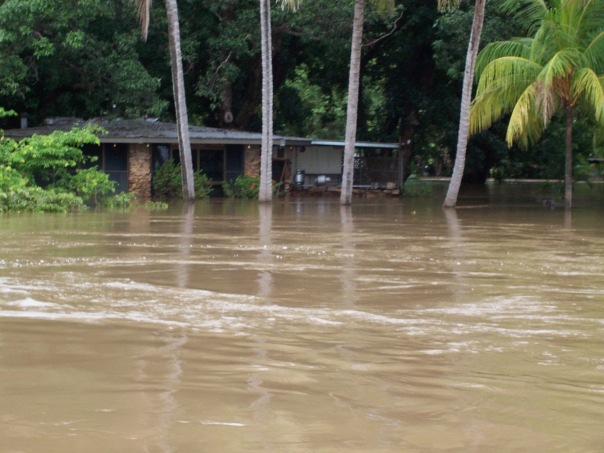 In Australia, February is summertime and our friends there sent pictures of the flooding at the mango farms. That’s a flight difference of something like a third of the circumference of the globe needing nearly 20 hours flight time from Nevada.